Adding a touch of midcentury Danish design and a high dose of whimsy; Kay Bojesen's quirky fun menagerie of modern animal figurines encompasses two rabbits, two elephants, one hippopotamus, three bears, and three monkeys. This antique Kay Bojesen animal-set dates back to 1951-1957 and features the "Kay Bojesen/Denmark/Copyright" mark on the bottom of the feet. This antique set is valued at Estimate: $3,000 - $5,000 by La Modern Auctions. 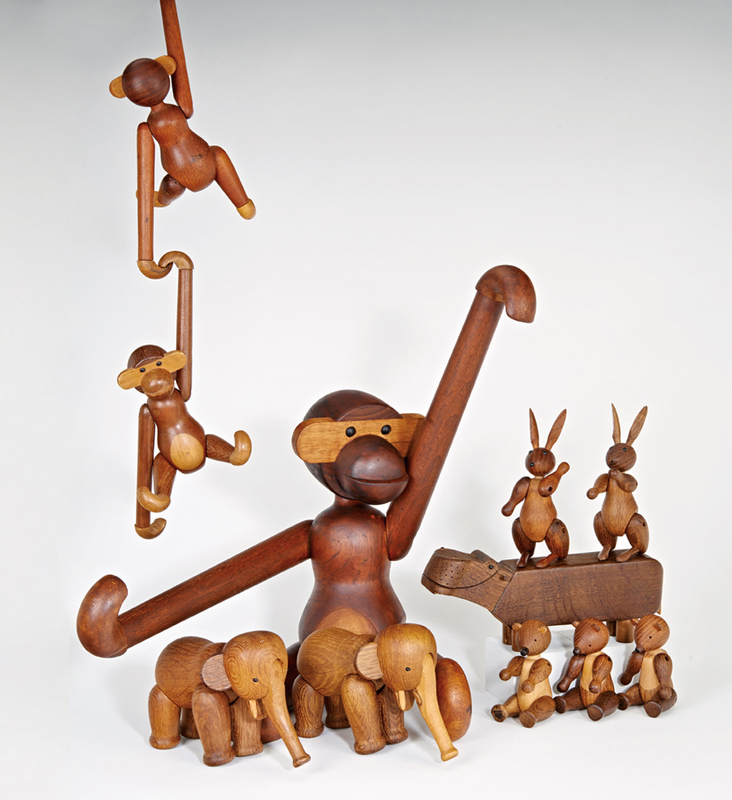 Love these wooden figurines but don't have 5 grand to spend; check out Stardust which offers the original authorized Monkey Family in new condition at accessible prices or search Stardust for their designer's name "Kay Bojesen". kay bojesen’s wooden animals are known and loved all over the world. he found inspiration for his designs on the various continents and now kay bojesen denmark is adding yet another animal to its “designer zoo”, the zebra. kay bojesen created the charming zebra as the first of the exotic animals in 1935. it has since been joined by the monkey, the elephant and the hippo, and now another four-legged playmate is moving from the savannah into the modern home. kay bojesen is known for his delightful humour and unique talent for wooden creations that bring out smiles. and nobody can keep a straight face when they gaze upon the pleasantly plump monkey. with its straight legs and bristly looks, the mokey lives up to kay bojesen’s ideal of creating wooden figurines that don’t seek to imitate nature. instead, it is full of charm and personality in every stroke and to the very tips of its toes.